Author: Mohler, R. Albert Jr. This is a timely book on preaching by Dr. Mohler. I greatly enjoyed it, keeping it close by on my Kindle and going to it in my spare minutes. 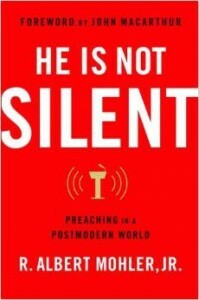 Mohler takes the reader through the homiletics of preaching but insists that “the only form of authentic preaching is expository preaching.” By this he means that the preacher must explain the text to his hearers or preaching has not taken place. “The heart and soul of expository preaching—of any true Christian preaching—is reading the Word of God and then explaining it to the people so that they understand it.” Mohler also takes contemporary worship to task. “The sacred desk has become an advice center, and the pew has become the therapist’s couch. Psychological and practical concerns have displaced theological exegesis, and the preacher directs his sermon to the congregation’s perceived needs rather than to their need for a Savior.” He continues, “The audacious claim of Christian preaching is that the faithful declaration of the Word of God, spoken through the preacher’s voice, is even more powerful than anything music or image can deliver. I also appreciated Mohler’s emphasis on the Scripture which we preach being the Word of God. “Does God speak today?” he asks. If we do not realize that God actually is speaking through His Word (as opposed to charismatic chaos) as we preach it, then we ought to stop preaching. In fact, then we ought to stop having church altogether.